The problem with a challenge like 30 Before 30 is that is has an inbuilt deadline. I had until I turned thirty to achieve each item, and I’ve never been particularly reliable around a deadline. Actually, that’s not strictly true; I nearly always get things done, but I like to take them right up to the wire, And so it was with this particular item on the 30 Before 30 list. As I explained when I first set my 30 Before 30 list, I picked fifteen films from this list for a number of reasons. Firstly, setting myself a challenge to watch 100 films (or 86, discounting the fourteen that i had already seen) in a year was folly. Never going to happen. Secondly, there are a handful of films on the list that I have no desire to watch. So I thought fifteen was ideal; perfectly achievable in a year. Especially as we already had a number of the films on DVD. As it was, I did achieve it. But only just. I had to extend the deadline, ever so slightly. I tried watching Oliver Twist on Netflix on Sunday night, the night before my birthday, but I fell asleep. This is no reflection on the film, I’m sure it’s great, but I was tired after a long weekend of actually celebrating my birthday. This mean that if I was going to cross number 25 off, I would have to watch the fifteenth film on my birthday itself. The way I look at it is that it’s my game, and therefore my rules. My birthday counts as the last day of the challenge. So when I saw that Alfie was on Film4 on Monday night, I thanked my lucky stars and watched it! So here are the fifteen films that I watched. I started with The Ladykillers on 6th January, and finished with Alfie on 12th November. I watched at least one film from the 1930, 1940s, 1950s, 1960s, 1980s and 1990s. The earliest film I watched (and on the list) was The 39 Steps from 1935. The most recent film I watched was The English Patient from 1996. Noël Coward wrote one of the films I watched, Brief Encounter, and directed and starred in another: In Which We Serve. Michael Caine starred in three of the films I watched: Educating Rita, The Italian Job and Alfie. Eight of the films were nominated for BAFTAs; six of them won. 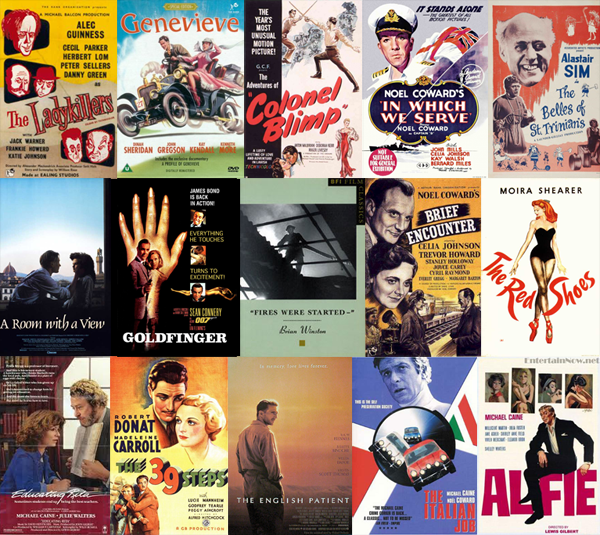 Ten of the films were nominated for Oscars, and four of them won (Noël Coward won an honorary award for “outstanding production achievement” in In Which We Serve). It’s tough to pick a favourite out of the fifteen films that I watched, because I genuinely enjoyed them all. Both Genevieve and Brief Encounter were particular favourites of my mum’s, so it was nice to sit down and actually watch them all the way through after all these years. At a push, I’d probably pick The Red Shoes, Educating Rita and Goldfinger as my favourites. I’m planning on keeping the list running, and crossing them off as I watch them. There’s no deadline now though, so watching (almost) all of them will take me years!